Hashimoto disease is a form of hypothyroidism. Hypothyroidism happens when there is too little T3 and T4 in the body. When this happens, there is too much TSH. Another term for Hashimoto disease is autoimmune thyroiditis. Goiter formation is significant in this form of hypothyroidism due to inflammation. (McCance & Huether, 2014). Inflammation is caused by stimulation of CD4 and T helper cells that are explicit to your thyroid. This stimulation can be either viral or bacterial in presence. (Lloyd, 2010). The influx of CD4 and T helper cells as well as activation of other autoantibodies produced by the B helper cells causes destruction of thyroid tissue. Apoptosis is activated by CD8 cells and is significant in the destruction as well. (Lloyd, 2010). To help differentiate between Grave’s disease and Hashimoto’s disease, there is a difference in major histocompatibility complex antigens. (McCance & Huether, 2014). Risk factors for Hashimoto’s includes genetics, increased iodine intake, smoking, and hepatitis C. (McCance & Huether, 2014). 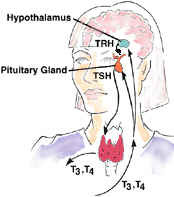 In normal hormonal regulation, the hypothalamus secretes TSH Releasing Hormone (TRH), which causes the pituitary to secrete Thyroid Stimulating Hormone (TSH), which then stimulates the thyroid to secrete TH (specifically triiodothyronine, T3, and thyroxine, T4) (McCance & Huether, 2014). By way of a negative feedback mechanism, TH levels regulate the amount of TRH and TSH secreted. Primary hypothyroidism, such is the case with Hashimoto’s disease, is caused by a deficient production of TH due to the loss of function of the thyroid gland. (McCance & Huether, 2014). This leads to a decrease in TH and an increase in TRH and TSH. One can look at this relationship as you would a person, a thermostat and a furnace. The person (hypothalamus) is cold, so they go to the thermostat (pituitary) and set the temperature warmer. The thermostat now tells the furnace (thyroid) to kick on and heat the house. However, since this furnace (thyroid) is not functioning properly, the house will not heat up. No matter how much the person attempts to make the thermostat activate the furnace, it will not heat the home properly. Hypothyroidism can have an effect on all body systems and proceeds insidiously over months or years (McCance & Huether, 2014). There are many manifestations for hypothyroidism and Hashimoto’s, but the above are the most common (Unbound, 2015).